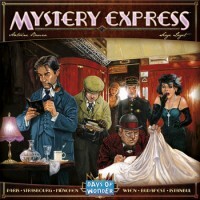 Once everyone in your gaming group has figured out a system to precisely identify the hour of the crime every time by the 3rd set of card flips, the telegram’s “guess” doesn’t mean much because everyone will get the time right since, according to the rules, the telegram is written after the card flips. If you write the telegram first, however, there is more incentive to try other strategies to hopefully identify the correct time earlier (either with some luck or a photographic memory), thus making that part of the telegram more worthwhile. Of course if people in your group have not all figured out a system or they make mistakes – or the card flipper is nasty and makes the third set of flips really difficult to track, then this variant won’t work as well. Still, in our group, writing the telegram first seems the better way to play. If your role allows you to investigate further, never forget to do so, even if you think you know what you will investigate, the confirmation is sometimes useful.